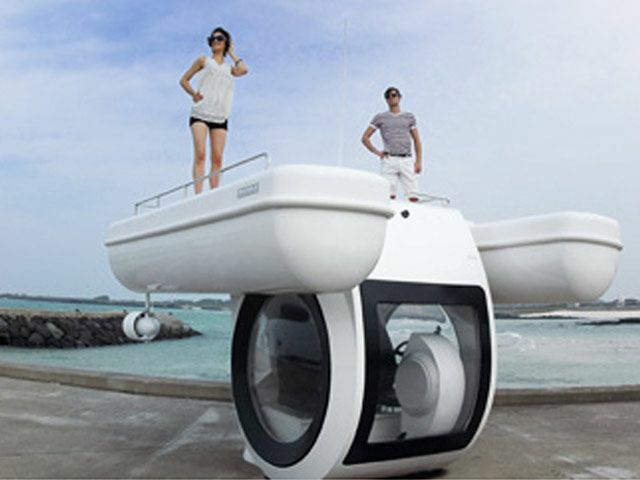 Korean company Raonhaje developed what it is calling the first compact “semi-submarine” – part boat part sub which gives its passengers a chance to observe the underwater world using a special enclosed unit submerged under the water directly under the ship for a magnificent ocean view. Ever wanted to view the underwater world without a diving suit? Korean manufacturer Raonhaje think it has the answer with the EGO – a special kind of vehicle – part personal sub part miniature yacht. As a ship, the EGO is a 3.35 meter, 3.5 ton vessel capable of carrying about 300kg. 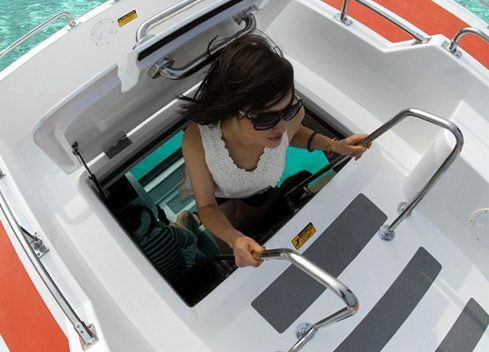 it has a super strong (20mm thick) huge acrylic window underwater which allows for clear view for the passengers below deck. The EGO is powered by an electric motor which is both green and far cheaper to run compared to conventional diesel engines. The electric engine is also fairly silent so the EGO will not scare off marine life. The top speed of the EGO is fairly slow – 3knots (coursing is set for 2knots) but this is expected for this type of vessel. The batteries allow the EGO to run for 4-8 hours depending on the speed. The EGO is also equipped with an LCD for monitoring what is going on in and around the ship as well as an VHF marine radio, depth gauge, digital foot pedal and a few other accessories. EGO comes in a number of variants – EGO SE for honeymoon couples who want a unique romantic tour or a Marina resort looking for a special attraction, a research and surveillance ship which can inspect the sea both above and below and as a private compact semi submarine for yachting for those who can afford this luxury (this version is known as EGO LE). Price for the EGO if you are looking to purchase one is set at $29,000-$38,000 for the smaller versions and close to $50k for the larger SE variant. You can find out more about the EGO on the Raonhaje website. Here at TFOT we covered many other innovative submarines including the $100,000 Killer Whale Personal Submarine, the Hyper-Sub powerboat capable of operating as either a surface boat or a submarine, the small two man Triton 1000 personal submarine, the sQuba car that turns into a submersible, and the unmanned Airacuda capable of diving and rising much like a traditional submarine.